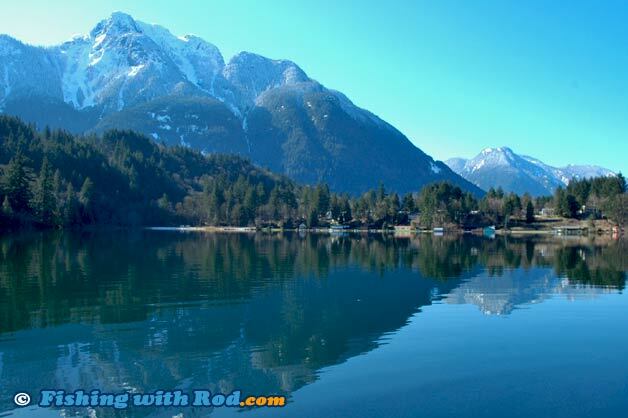 Kawkawa Lake is another quality fishing lake that is within reasonable driving distance from Vancouver for day trips. During peak season, its non-stop fishing action means parents can bring the kids along without worrying about boredom setting in. Due to its healthy plankton productivity and cold groundwater feed, Kawkawa Lake is one of several lakes that offers a kokanee fishery in the Lower Mainland. Kawkawa Lake is just outside of City of Hope, which is approximately 1.5 hour of driving from Vancouver. Once arriving in Hope, follow the signs to Kawkawa Lake Road. Turn off at Lakeview Crescent at the southwestern corner of the lake, where a boat launch and picnic area is located. Washrooms are also available. Kawkawa Lake is closed between December 1st and February 28th. The kokanee fishing is often good from March 1st, as long as the lake is ice-free. Kokanee fishing on the surface peaks by mid to late March. Fishing for cutthroat trout and landlocked coho salmon can also be good during this time. April and May are often quiet, but fishing heats up once again between June and August when the schools of fish are concentrated on the lake bottom. Unfortunately, shore access is limited to private properties on Kawkawa Lake so a boat is necessary if you choose to fish it. The boat launch is wide enough for anglers to launch a large craft. Although there are no restrictions on the boat and engine size at Kawkawa Lake, operators of larger crafts should be aware of small boats and float tubes nearby. Respect other users by going slow so no large wakes are created. Float tubes and pontoons are also ideal crafts for Kawkawa Lake but keep in mind that the water is always very cold so dress appropriately. When surface activity is apparent on a cloudy day during March, flyfishing can be quite effective. Small chironomid patterns in size 12 to 16 work best when fished under a strike indicator. Microleech patterns in red often produce when stripped or trolled slowly just below the surface. These kokanee are usually 14 inches or less, so a 3 or 4wt rod provides both the sensitivity and strength to tackle them. The most common method used when fishing with bait is by sending it to the bottom on a sliding weight rig. A small sliding weight around 0.5oz is threaded onto the main line, which is tied onto a swivel. At the other end of the swivel, tie a 2ft long 4lb test leader, followed by a size 4 or 6 hook. Cast your rig out and let it sink to the bottom. Tighten the line and wait for the bites. Kokanee are light biters, so you need to pay attention to the rod tip. Occasionally, the rod tip does not tape when the fish are biting, the line becomes slack instead. The choice of bait is krill, which can be purchased at your local tackle store. Krill dyed in red typically work best. Deli shrimp also work, but are often outfished by krill. This method is commonly used between June and August, when schools of kokanee are found at the depth of 40ft and beyond. Cutthroat trout are also found in Kawkawa Lake, but they are outnumbered by kokanee so anglers do not target them specifically. They can be caught occasionally when flyfishing for kokanee, especially around creek mouths on the south side of the lake. Kawkawa Lake also has a population of landlocked coho salmon. These fish are usually 12 inches or smaller and characterized by their heavily spotted back just like the ones found in the ocean. They cannot be legally retained, so be sure to identify your catches first. Kawkawa Lake is located in Region 2 in the British Columbia freshwater fishing regulations. A large percentage of the shoreline is privately owned so please respect residents, wildlife and other boat users around the lake by keeping the noise level down and picking up your own garbage.